One of the sad facts about the vast majority of the great ideas you and I will have is that they will never become a reality. There are many reasons for this: lack of time, money, motivation, resources, etc. But possibly the biggest reason many ideas never become reality is a lack of organization and follow through. We think of something and forget it. We write it down on a piece of paper and lose it. Or we trick ourselves into thinking we’ve captured the idea in a word doc or notebook only to neglect it and never revisit it. I know from personal experience just how frustrating this behavior cycle can be. Over time I’ve even noticed a subconscious tendency to immediately dismiss things that are not immediately achievable because I’ve trained myself not to nurture my dreams and ideas. This can be especially upsetting when you see someone else accomplish something new and exciting only to realize – I had that idea years ago and never did anything with it! 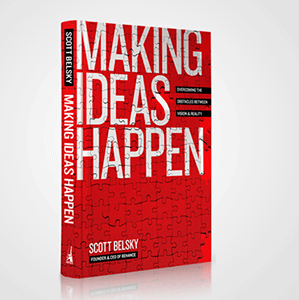 Enter Making Ideas Happen by Scott Belsky. This book, which I read last year, has been the answer to recognizing and overcoming the cycle of unproductive behavior described above in my own life. Or at least up to the point at which I’ve been able to follow the advice inside it. The subtitle of Making Ideas Happen says it all: Overcoming the obstacles between vision and reality. Which constitutes a life mission for author Scott Belsky who is also the founder of popular creative portfolio site Behance and the 99% Conference/Blog. Both in this book and in the way he runs his web properties Belsky is all about removing obstacles and empowering creatives to see their ideas through to completion. Belsky has researched and studied the lives and careers of some of the most successful/impactful creatives in recent years with the goal of breaking down their process of taking an idea from concept to completion and giving the rest of us a method for achieving those same high levels of “idea conversion”. The process Belsky and company have come up with is called The Action Method. So, what is The Action Method? Well it is a method, in the sense that it has a few generic steps to follow, but more than anything The Action Method is a philosophy of forward momentum. Or as Belsky puts it in the book it is approaching your life and work with a bias toward action. Action Steps: brief tasks beginning with a verb to indicate action. Ex: Call Tom, Write blog post, etc. Reference Materials: meeting notes, sketches, non-actionable thoughts, etc. Backburner Items: things that may become action steps in the future but currently are not. Ex: If x happens, then do y. Likewise, backburner projects are projects that may become possible in the future but are not currently. Ex: write and direct a sequel to the Harry Potter movie franchise. It’s important to note that The Action Method is just the tip of the iceberg when it comes to the great content inside Making Ideas Happen. It’s just one part of the first of three great sections on what it takes to consistently take your ideas from concept to completion. For the purposes of this post however, I’m concentrating on how to best manage backburner items and projects – which are a specific part of The Action Method that requires you to create a personal ritual. But I’ll talk more about that later in the post. First, I’d like to show you how The Action Method looks, uh, in action. The beauty of the action method is its extremely simple structure. Look at your life through a “project lens” and break down your dreams, hobbies and responsibilities into various projects. Under each project create three “folders” – one for action steps, one for reference material and one for backburner items. You can do this however you like: pen and paper, folders and notebooks, word docs, google drive, etc. Personally, I use a combination of Evernote and Asana to accomplish this. 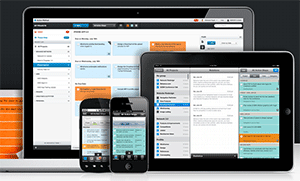 Evernote for planning and development and Asana for execution and delegation. In Evernote I create what’s called a stack for each project in my life with two of the three folders – called notebooks in Evernote – I mentioned a moment ago: reference material and backburner items/projects. I also create specific notebooks for other things associated with developing my ideas. For instance, each of my blog projects has a “post ideas” notebook. When inspiration strikes, where ever I might be, I can use either the desktop or mobile Evernote apps to capture that idea in video, audio, text, or image form and quickly assign it to the appropriate project for later reference. Asana on the other hand is where I create specific action steps for every ongoing project or project ready to leave the purely developmental stage and begin the process of becoming reality. 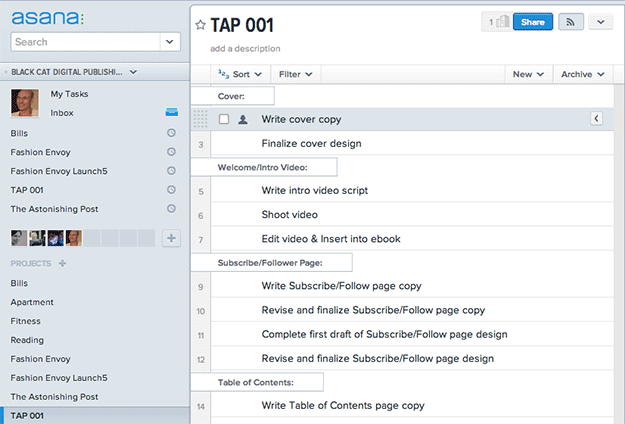 I then assign each task a due date and an owner. 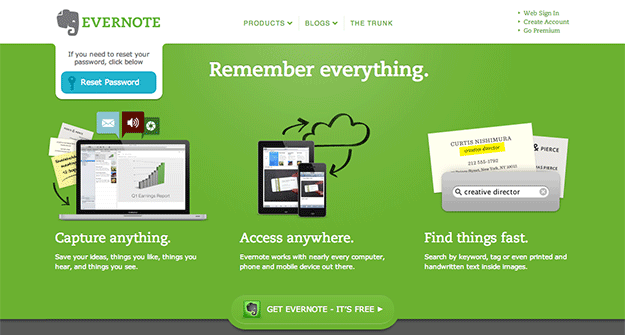 I can also copy and paste, link to or attach the reference material I’ve gathered in Evernote. So that’s the organizational structure for the process, what makes capturing and recording ideas/action steps easy and efficient. Now let’s talk specifically about creating a personal ritual that promotes action, especially on those backburner items that have a tendency to be left unattended. As I mentioned at the beginning of this post, it is essential to not only capture ideas but to revisit them on a regular basis so that they do not lay dormant and go to waste. This can prove difficult though. Even if you’re incredibly organized and successfully capture a large number of ideas, finding the time to review and further develop those ideas can seem all but impossible. Fortunately, that is not the case. For me, each work week starts on Monday and ends on Friday. I have a daily schedule and ritual that I’ve developed over the last few years that works for me and keeps me chipping away at my daily action items and meeting deadlines. 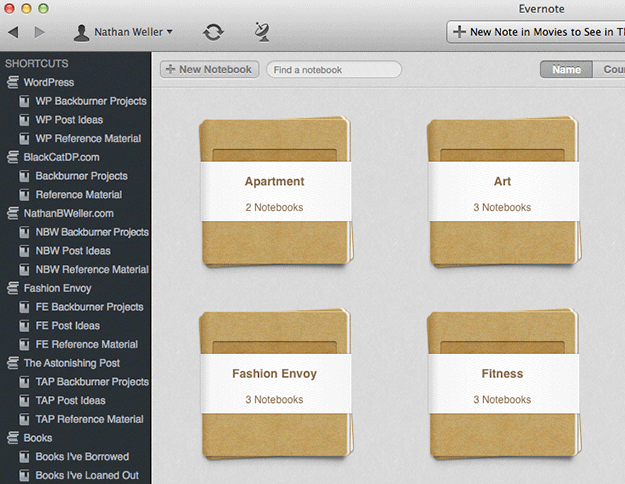 But before my work week starts I like to take some time on Sunday to open up Asana and Evernote and plan everything out. With the organizational structure described above already in place, this takes a surprisingly short amount of time (between 30-60 minutes). I start with my active projects in Asana. I make sure anything from the week before that did not get completed is rescheduled for the coming week and added to the action items already there. This allows me to mentally prepare for the type of week it’s going to be; normal, extra busy or in some cases light with extra time to spare. 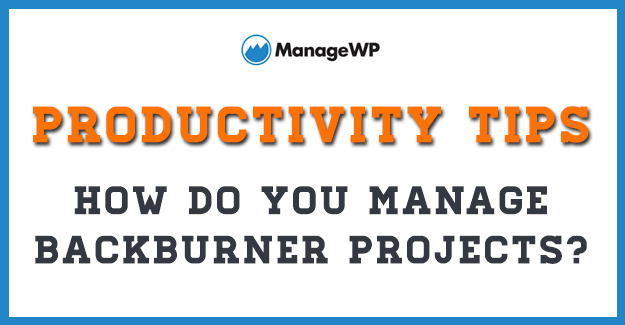 In those cases when I can see that my workload will be lighter than usual I browse through my active project backburner items in Evernote and look to see what might have become actionable that week. Usually the reason something wasn’t immediately actionable when I thought of it in the first place is something very simple. I didn’t have the time right then, it cost $50 that I didn’t want to spend at the moment or something like that. So oftentimes it’s very easy to identify the things I can add to my weekly workload as the small obstacles that had been keeping me from them a day or week ago are now gone. Those are the easy-to-integrate backburner items. But then there are the bigger items, those long-range dream projects that need a lot of development (such as writing a novel or screenplay) that are not immediately profitable or something that can be completed in a single day, week or even month. Those projects I treat as rewards. I’ll set a revenue goal for the week or push myself to get all of my client work done early and as my reward for meeting those goals I indulge my desire to work on these pet projects in the time left over. Usually that goal looks something like this: If I make $X and complete all client work by Thursday night, I get to spend all day Friday doing Y. Of course there is no rule that says it has to be all day Friday, but I like making it an all day thing because it feels really exciting and indulgent and it motivates me to work hard during the week. Admittedly, my specific ritual of planning on Sunday and working toward a “day of indulgence” at the end of each week will probably only work for other freelancers who have control over their own time. Your ritual may (and probably should) look very different from mine, but the important thing is to have one that consistently evaluates past ideas and converts them (when possible) into action steps. I’d love to hear about how your own methods stack up against the things I discussed above. What do you think of Making Ideas Happen, The Action Method, using Evernote and Asana that way I describe and my personal ritual of integrating backburner items/projects into my weekly workflow? Tell me all about it in the comments below! Great post as usual, Nathan. 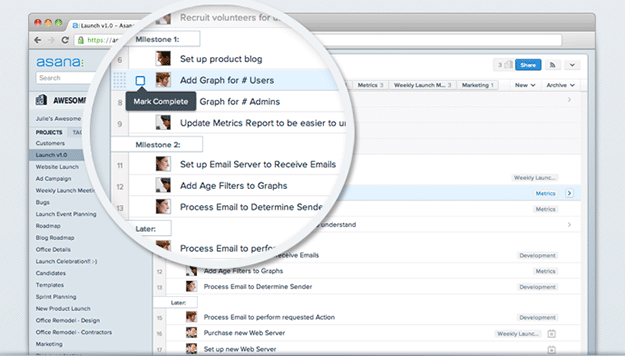 Asana is a nice tool but I find that hiTask suits me much better. I can fit recurring tasks at specific times of the day/week/month so I never forget to revisit places and sites where I get inspiration. You are right in that getting structure to whatever method works best for you is VERY IMPORTANT. Become a creature of habit but not so much that you end up being inflexible. Make sure there are plenty of small “whitespaces” in your day to fit in those small things that interrupt a regular day. Such as popping out to the shops, having a quick nap to help get rid of a headache, going for a walk, or merely spending quality time with your cats. Yes. The “whitespace” is so important. Sometimes my cats choose when those whitespaces happen! Seriously, who can work when your cat wants you to play. They’re so good at making work impossible when they want to. Anyways, thanks so much for the comment. I’ll have to check on hiTask and see what that’s all about. I’ve actually never heard of it before. This is a really great post. I can see from personal experiences just how true this is. Will use the information provided and put it to use.